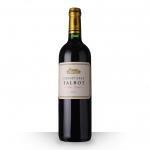 The Château Talbot 2011 (£53.28) is a red wine made by Château Talbot from the region of Saint-Julien made of cabernet franc, merlot, petit verdot and cabernet sauvignon of 2011 and has an alcoholic content of 13%. 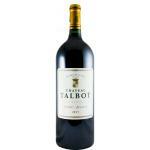 The Château Talbot 2011 is the ideal red to combine with parmesano and birds. 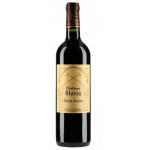 According to Uvinum users, this red wine earns 4,3 out of 5 points while wine experts grade it as follows: robert parker: 90 and wine spectator: 90. It is located on the plateau of Saint-Julien-Beychevelle you can see from afar, the Château Talbot, on the edge of a sea of ​​vineyards between the tall trees of the park. 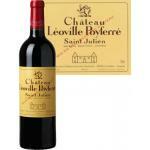 The history of this wine is rich. 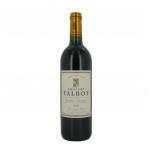 Named after the Constable Talbot, famous English warship, governor Guyenne, defeated at the Battle of Castillon in 1453. 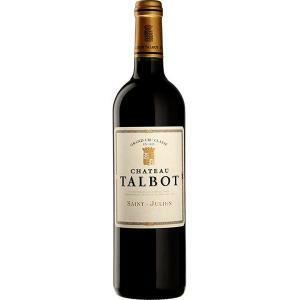 A total of 107 hectares of vineyards of Chateau Talbot extends throughout the house borders the north of the appellation of origin, on the edge of Pauillac. Cherry red colour. Sweet caramell flavour.. Do not know what had to taste like, but it was tasty. This vintage has a beautiful violet purple. 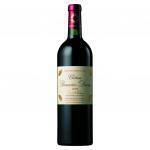 The mouth is expressive and has pronounced aromas of black fruit structured by fine, silky tannins. Bright red and purple reflections. Deep scent, like coffee.It had a correct astringency. 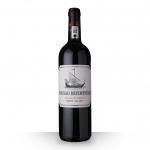 A red Bordeaux Cabernet Franc. I liked its toasted aromas. Correct acidity. 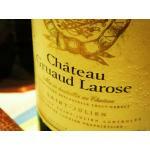 The best wine for a fish dish, like tuna. You can take it with any meal. Great for romantic evenings. Red intense cherry colour and high layer. Scent of red roses. A surprisingly fresh wine. Red primary color with violet hints. Raspberry is perceived upfront. A very light red. I went with work colleagues to and we taste it there. 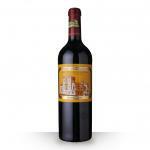 A red Bordeaux . Smelled soft, like cinnamon and vanilla . It was a surprising wine. The matches quite good with game meats. 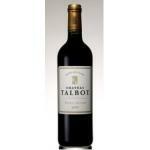 If you want to buy Château Talbot 2011, at Uvinum you will find the best prices for Saint-Julien red wine. At Uvinum, at the best price, in a 100% secure and easy process. We're the only site in Europe with more than 59.000 products for sale which makes us leaders in the sector of selling wine, beer, and spirits in Europe thanks to more than 38.000 customers enjoying Uvinum.